We are Randy and Robyn Murrah. Together we own R&R Highlands. The Farm is located just outside of Milaca, MN. The farm was established in 2006 with a couple of horses and a few chickens. We quickly realized that the horses were not going to be able to keep up with the overgrowth that had taken over the land. In order to improve and maintain the land we knew we needed a different kind of animal. 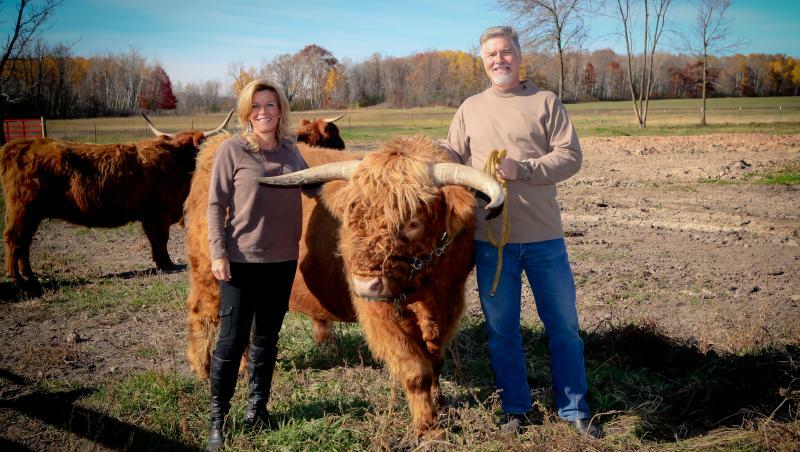 Robyn and I both grew up on farms with cattle, so we decided to return to our roots. The question was .... which roots. Robyn grew up on a dairy farm in Milaca, MN. A dairy farm is a full time job and since we already had full time jobs elsewhere, we really didn't want another one. So, we knew that business wasn't what we wanted. I grew up in Texas and spent my teen years helping my father in his cattle business. He had a large herd of mixed breed beef cattle. Summers were spent bailing hay, mending fences, and tending to the cows. Fall was rounding up yearlings to take to the sale barn. Winter meant daily feeding of hay since this was before the days of large round bales. Spring was looking after the new babies and making sure all was well with the momma cows. After looking into various breeds of cattle, we chose Scottish Highlands. The Highlands are a hardy breed with a number of interesting traits. These cows are exactly what we needed to clean up years of overgrowth and return the land to a usable pasture. After building what seemed like miles of fencing, we obtained our first few head of cattle. After several years of growing the fold and selling both breeding stock and beef, we now have 17 head and should have 6 new babies in the spring of 2015. Unlike the cattle I grew up with, Highlands are intelligent, personable, and each is unique in their own way. Some like to be combed while others do not. Some like alfalfa cubes, some don't. Some crave attention, some would rather have none. We try to give each cow what it wants. In return, we get the enjoyment and satisfaction of raising a truly unique animal. At R&R Highlands we now focus on providing quality hay to local customers and some custom baling. We also plan on renting/bartering our pastures to local farmers who need extra space. We own 70 acres of land which we have divided for use as rotational grazing pastures, forest, and meadows for our hay operation. We produce all the hay required for our current operation. Our hay is a mixture of timothy, brome, and naturally occurring weeds. We don't use any herbicides, pesticides or chemical fertilizers so I guess you could call it organic. I do my best to cut it, rake it, and bale it at the peak of its nutritional cycle. However, mother nature sometimes has a different idea and we adjust our schedule to hers.